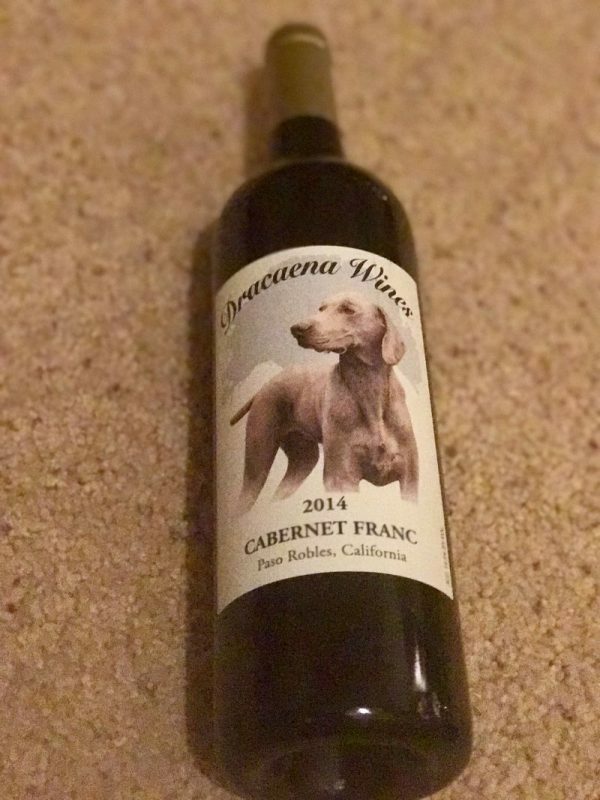 Dracaena Cabernet Franc 2014, tasting with wine friends……. 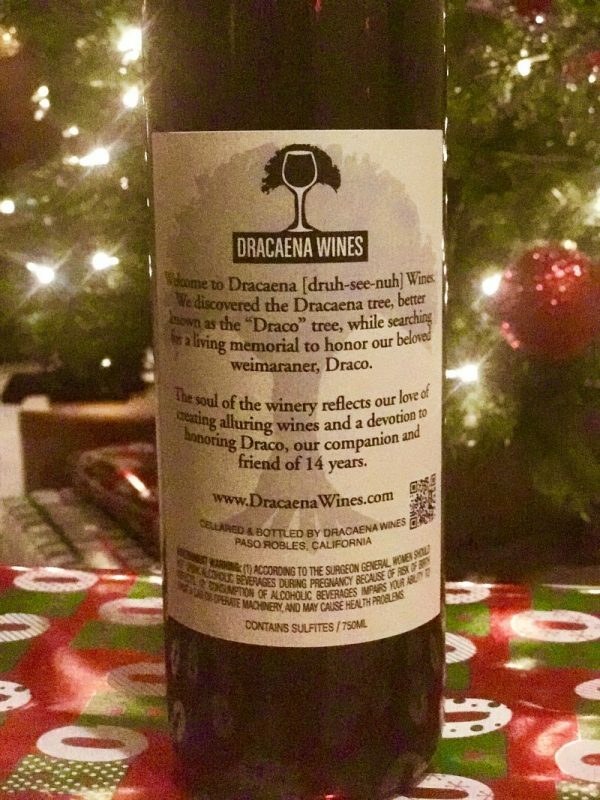 I had first heard of Dracaena wines from my Twitter feed. Many of the other bloggers we follow were talking about how good Dracaena wine is. I had also seen many cute tweets from the winery owner, Lori. It made me curious. Lets be honest here; I am always up for a good wine find, so I ordered three bottles. They were an affordable $32.00 a bottle plus they had a big discount on shipping promotion going. Everyone loves a deal right? Lori is a total sweetie and made my order really simple. Honestly, I had never purchased wines online before. We always buy our wines from either retail stores or go directly to the winery and taste the wines there. This was a new experience. I was surprised how quickly the wines arrived. Hmm, wine being delivered to my door. Is that a good thing or a bad thing? Suddenly there is no incentive to get out of my jammies to get wine. It just comes to me. Awesome! That night we were all getting together to plan our New Years Eve celebration, so it was the perfect time to test out the wine with everyone in a happy mood. There were eight of us there, all experienced wine drinkers. Each couple has multiple memberships at wineries all over Napa, Sonoma, and Suisun Valleys. When we opened up the bottles the overwhelming smell of raspberries knocked us all over. It smelled like raspberry wine, it was so intense. All of us really liked it. There were some wow’s in the smelling, and other people were intent on picking up other notes. For me there was also the hint of dark chocolate in the background – chocolate and raspberries being a favored combination for me in desserts. I had to wonder with a smell like that if it was going to be overly sweet. There were remarks of surprise from every single member of our group. No one could believe that it was a Cabernet Franc. The flavor seemed far more akin to a good quality Zinfandel. Silky, smooth and very “jammy” without being sweet. Everyone really liked it, but felt that it wasn’t like any other Cabernet Franc they had tasted before. This expression of the grape was unique. One of the most experienced wine drinkers of the group loved it so much that he asked me for the details so that he could buy some bottles. If you are a person who likes very fruit forward, lush, jammy wines with a dominant note of raspberries; this wine is for you. I would pair this with cheese, or game meats like duck or venison. The fruit and round body would be a perfect complement. This wine got a big thumbs up from all of us. 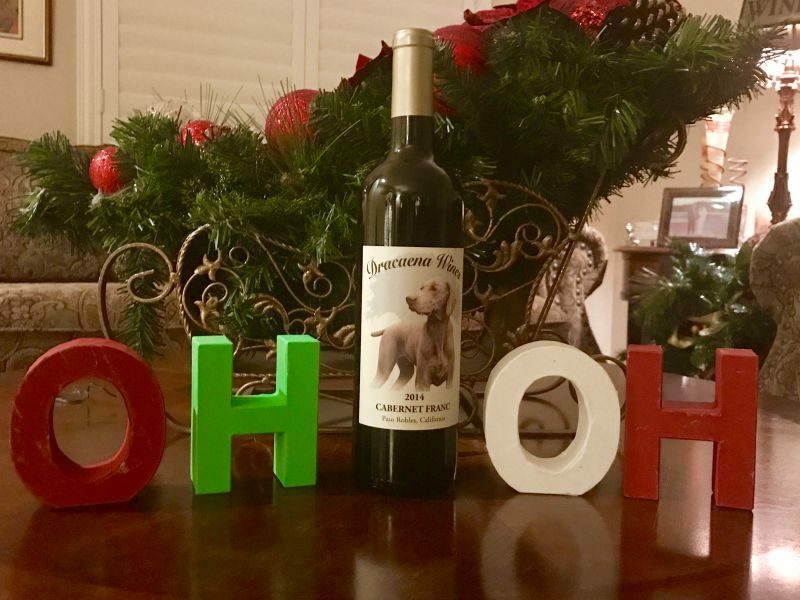 As our group is a bunch of dog lovers we all adored the label on the bottle that features a Weinmaraner. 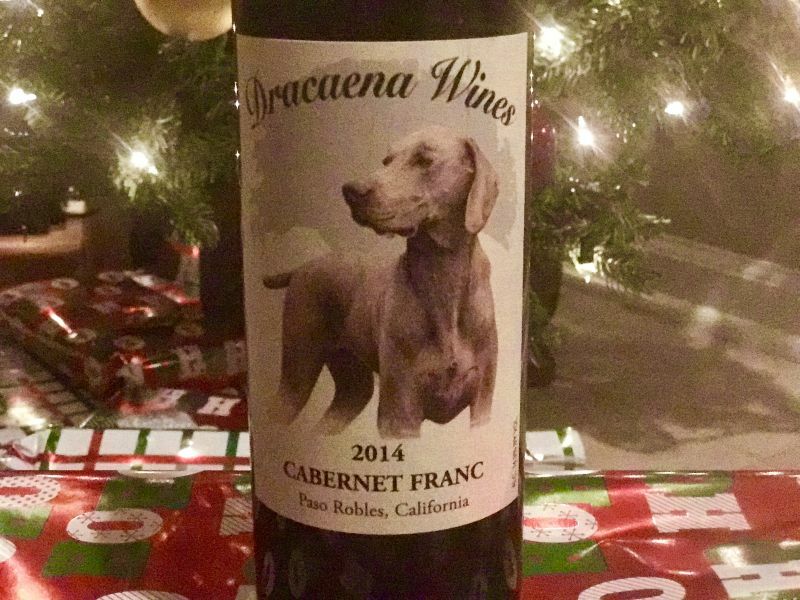 You can pick up your bottles of Dracaena Cabernet Franc from their website. The Brit comments: I am glad I did not taste this wine blind as part of a challenge; I would never have identified it as a Cab Franc. Maybe, this suggests I need to drink a wider range of Cab Franc, or drink more wine from the Paso Robles area. In either case, this striking and tasty wine clearly implies that further tasting is required. P.S. I may or may not have been a little tipsy taking these photos…. I was having fun! Thank you so much! Yes, I did a huge gulp when you stated 8 experienced wine consumers were in one room! ??? ?- no pressure at all – We are so happy that you all enjoyed it! We agree with your pairing choices. We like to recommend aged Gouda for a cheese recommendation. We love 1000 day aged Gouda. (We joke that someone counts the days). Thank you again! Sláinte!